Here's what I learnt by attending Amazon Internet Services Private Limited's media masterclass on AWS' AI and ML services. One thing's for sure: Amazon is out to 'democratise AI'. I’m going to admit shamelessly that most of the classes I attend leave a soporific effect on me. Either I begin to nod off or manage to lose all of my attention in a peaceful reverie where chocolate cake is considered good for the health. 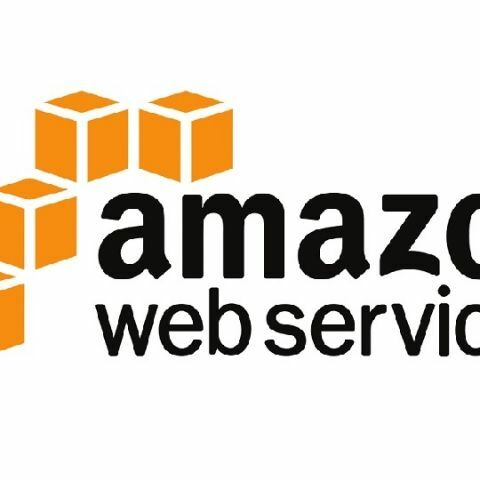 However, the class I attended this week was far different—I was riveted to the presentation and the convincing voice of a lively speaker while learning some interesting facts and details about Amazon Web Services’ current offerings. Before I go on, I’d like to let you know that what I attended was an hour-long ‘Media Masterclass’ on Amazon Web Services’ Artificial Intelligence (AI) and Machine Learning (ML) services, hosted by Amazon Internet Services Private Limited (AISPL). The class was conducted by Madhusudan Shekar, a Principal Technical Evangelist at AISPL. The class was preceded by an introduction by Navdeep Manaktala, the Head of Business Development at AISPL and was followed by a testament from AWS customer, Ashish Gupta, who is the Chief Technology Officer for PolicyBazaar.com and the Chief Executive Officer for Docprime.com. With the aid of short video clips, Shekar began by explaining how Amazon is currently using its AI/ML services to improve its own products and services. He cited the example of Amazon Go, a grocery store concept that uses computer vision, deep learning algorithms, and sensor fusion to allow customers to buy groceries without waiting in a queue at the checkout registers. Fitted with numerous cameras, the store registers a purchase when a customer picks up an item and bills them for it directly to their Amazon account and sends them a receipt. Shekar also explained how AI/ML services are being used to speed up orders in Amazon’s fulfillment centres. For example, if milk and bread are frequently ordered together by customers, the racks containing these items are automatically stacked closer using warehouse robots so they’re more easily accessible for extraction and packaging. The evangelist then explained how Generative Adversarial Networks (GANs) are capable of generating photographs that look, at least superficially, authentic to human beholders. He explained this with examples of film studios using AI/ML technologies to make rendering animations for new films under production simpler and faster. Shekar then cited the case of Shaadi.com, an AISPL customer that uses AWS’ technologies to moderate images uploaded on the website. For example, the website is capable of identifying the gender of a person in profile pictures and flagging inappropriate images without user intervention. This eliminates—or at the very least, reduces—the need for extra manpower. As part of his presentation, Shekar explained the progress AWS had made with Amazon Polly, the company’s “lifelike” text-to-speech (TTS) service. Playing several audio samples of Polly’s various voices for us, he went on to show how capable Polly was at supporting SSML (Speech Synthesis Markup Language) tags. He ended the explanation by dropping the news of the addition of Hindi in Amazon Polly's voice, Aditi. 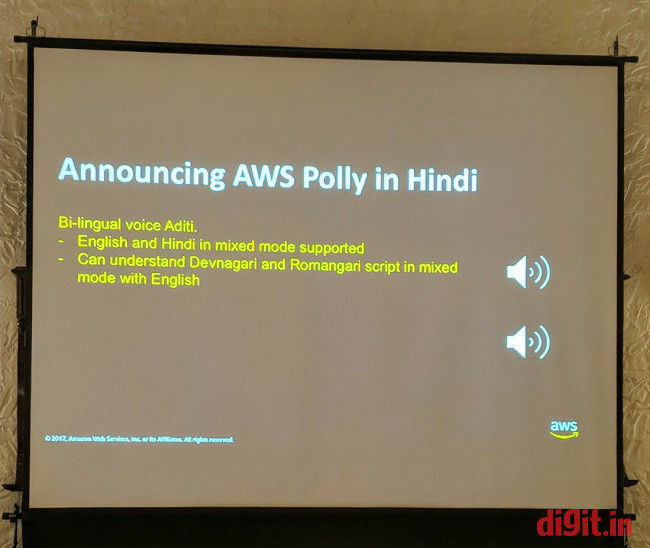 Marking the introduction of a bilingual voice in Amazon Polly, Aditi is now equipped to deal with Hindi and Indian English in the same sentence. Before ending the session, Ashish Gupta came up on stage to show how AWS’ AI/ML services are currently helping PolicyBazaar.com simplify customer care. According to him, the services, including Amazon Polly, have helped the company develop PBee, a voice bot for customers seeking post-sales support. In his presentation, he played audio samples of conversations exchanged between PBee and calling customers to demonstrate its usefulness and advantage over traditional IVR. By the end of the session, it seemed to me that AISPL really wanted to drive its current mission statement home: ‘Put AI in the hands of every developer and data scientist.’ Though it’s hard to tell in events like these when automation takes on the more glorified moniker ‘Artificial Intelligence’ and easy to mistake brand promotion for actual, usable information, I believe AISPL’s ‘Media Masterclass’ on AWS’ AI/ML services left me feeling positive about the future of computing.